They are low-maintenance and beautiful. They are great for offices, homes and class-rooms. See our “events” page for listing of future classes to build your own, or stop-in to pick up a ready-made terrarium today. Groups are welcome to schedule a terrarium building workshop. The latest and most exciting trend we are seeing in the garden center today is terrariums and miniature gardening. With a decline in children and adults spending quality time outside in nature, people are bringing nature indoors. Terrariums take very little care by design. They practically water themselves! Terrariums take up very little indoor space. In a terrarium you can create a little world or scene with simple props. Each terrarium is a small piece of art and nature together, that reflects it’s creator’s hobbies and dreams. Unlike terrariums, miniature gardening happens outside, but still in a small, easy to manage space. 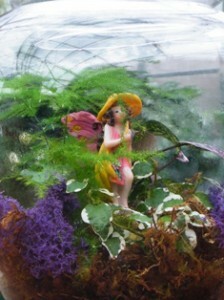 Many of our clients make fairy and gnome gardens with miniature plants that are smaller versions of the bigger plants. They add stone pathways, tiny arbors, figurines, you name it. With a little imagination you can make a beautiful tiny world. Out railroad gardening friends were some of the first people we had buying dwarf plants like creeping thyme and Irish moss, along with dwarf evergreen and deciduous trees and shrubs. Their small scale worlds transport us to another time and place.